This winter has already brought plenty of excitement to Sweet Water Foundation, as two co-founders were recently honored for visionary contributions to their communities. Emmanuel Pratt received the Green Award from Chicago magazine, and Jim Godsil was named a finalist for the Milwaukee Awards for Neighborhood Development Innovation, or MANDI. While the Sweet Water team is no stranger to the spotlight (you may have heard about Pratt and Godsil in the New York Times or Salon), it’s especially impressive that the two leaders have been recognized in such quick succession for community development and urban agriculture. Aquaponics relies on a deep understanding of symbiosis—in nature and in neighborhoods. Perhaps it’s no surprise, then, that Sweet Water grows in harmony with its communities. 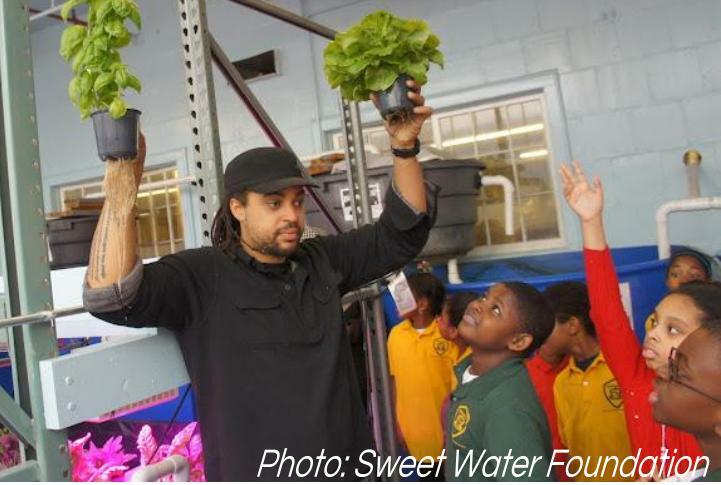 Chicago magazine describes their five Green Award recipients as innovators and local heroes, and in the April 2013 issue, they profile Sweet Water Foundation Executive Director Emmanuel Pratt, sharing the inspiring story of the rise of aquaponics on Chicago’s South Side. As Leo Ries, LISC Milwaukee Executive Director, explains, “The MANDIs recognize the inspiring, innovative, and tenacious work of people who are improving the quality of life in our central city.” Sweet Water co-founder Jim Godsil fits the bill perfectly and was announced as a finalist for the Northern Trust Navigator Award for his achievements in leadership and collaboration. A video profiling Godsil (which you can watch below) describes a lifetime spent pursuing social equity and sustainable community development that has culminated in the blossoming of Sweet Water Foundation. “The convergence of environmental and social justice has tremendous resonance,” says Joe Recchie of Praxia Partners. Sweet Water Foundation has mastered that convergence. In fact, both awards showcase Sweet Water’s ability to transform languishing urban space into a vital community asset that combines sustainable, local food production, job training for veterans, youth mentorship, and innovative urban revitalization. 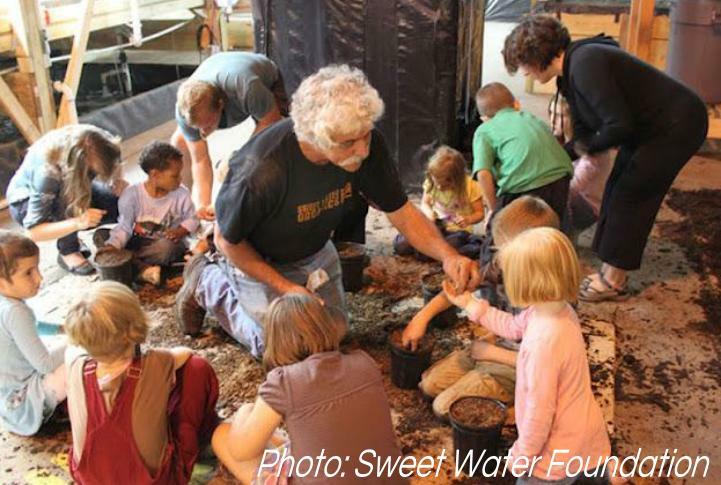 In 2008, Godsil oversaw the metamorphosis of an empty railroad factory in the Bayview neighborhood into the thriving center of agriculture and ingenuity that is Sweet Water Foundation. In Chicago, a former shoe factory sat empty on the South Side until it was bought by Chicago State University and transformed into a bustling hub of local food production and education. Staff and volunteers are passionate about environmental sustainability, and the local support they receive is integral to Sweet Water’s proven sustainability as an organization. Thanks to its strong leadership and deep roots in communities, the Foundation has become a powerful force in the aquaponics revolution nationally and globally. Their ascendancy exemplifies the possibilities that urban renewal holds. As we move out of winter into spring, we look forward to discovering the successes 2013 has in store for Sweet Water Foundation. One thing is certain: Sweet Water will continue to grow and flourish alongside the communities it calls home. Sweet Water Foundation is the first partner in our Bridge Program here at Praxia Partners, and we congratulate Jim Godsil, Emmanuel Pratt, and all the volunteers and staff who make Sweet Water Foundation a success! We’re excited to see what the rest of 2013 holds for Sweet Water Foundation as it continues to come into full bloom. This entry was posted in Bridge Program and tagged Chicago, inspiration, Milwaukee, social justice, sustainability, Sweet Water Foundation. Bookmark the permalink.